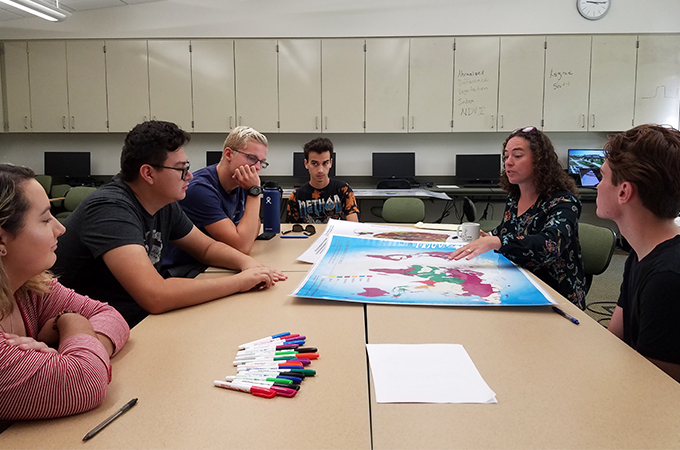 Professor of Sociology Kim Coles (second right) shows students how satellite imagery of Malaysia can reveal low- and high-wealth neighborhoods. Every year, incoming students at the University of Redlands have the opportunity to embark on a First-Year Journey. First-Year Journeys are outdoor adventures, taking students to the beaches, mountains, or deserts of California, Utah, or Arizona and providing an opportunity for students to get to know each other before the school year begins. “We wanted something similar to a First-Year Journey experience for these students, where they’d have a cohort that they felt closer to,” says Professor of Spatial Studies Alana Belcon who developed the idea for the experience from a summer program she has offered to high school students in Brooklyn, New York. First-Year Academic Experience students plant succulents and paint terracotta pots during their first night on campus. At the beginning of the seven-day course, Belcon provided the five incoming University of Redlands students with an overview of GIS, what it is used for, and why the U of R considers itself a spatial university. The students also learned about earth science using ArcGIS Online, a type of Esri software used to create maps, and also explored an augmented reality sandbox in Professor Hillary Jenkins’ lab in Lewis Hall. During a field trip to the Palm Springs Aerial Tramway, students mapped parts of the valley seen from the top of the tram. In the following days, the students examined religious diversity in Congress with Professor of Religious Studies Lillian Larsen, mapped Africa’s ecoregions and their correlation to disease and trade with the help of History Professor John Glover, and learned how to differentiate between low- and high-wealth neighborhoods in Malaysia via satellite imagery with Sociology Professor Kim Coles. 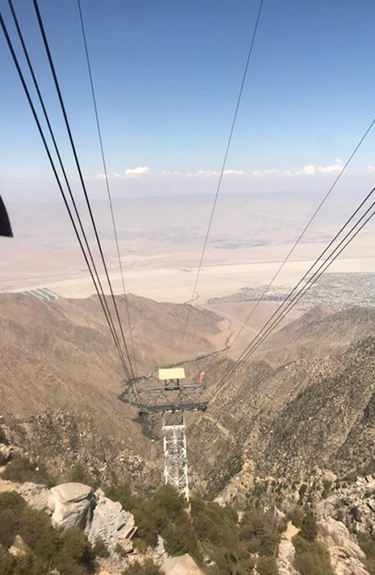 During the weekend, the group took a field trip to the Palm Springs Aerial Tramway and mapped part of the valley that can be seen from the top of the tram. The week ended with the students creating their own online story maps on a subject of their choice and then presenting the story maps to faculty, Dean of the College of Arts and Sciences Kendrick Brown, and various administrators. Nicholas Phillips '22, who created a story map on California earthquake awareness and preparedness for his presentation, said that the week surpassed his expectations. "I think the most valuable part of this experience was that I had the opportunity to meet and introduce myself to 15 professors before school even started. I was also able to present to and meet the dean of the College, which I don't think a lot of students ever get to do," he said. In addition to focusing on GIS, Belcon added her own flourishes to the week to make sure the students felt welcome. 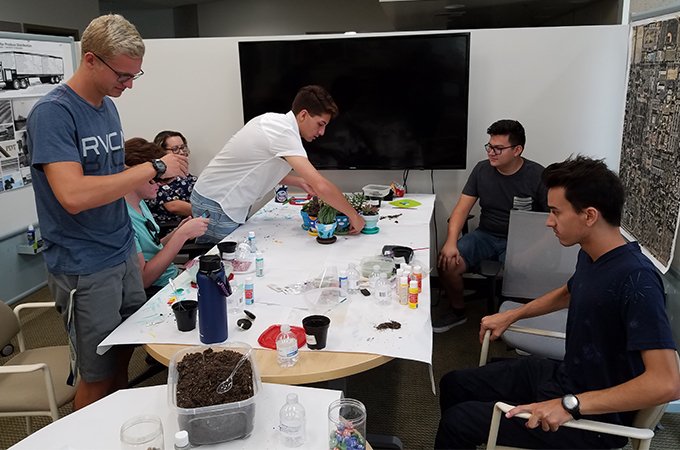 “When they arrived on campus on Sunday, I didn’t want their first night to be spent alone in a residence hall, so we had a succulent planting party,” she says. Other activities included a board game night with pizza, a movie night, and a trip to Market Night in downtown Redlands.